"Far from the madding crowd" there can be a patch of peace above the concrete jungle below your balcony or on your patio. All it takes is a modest sum of money, time and energy. If this is not an option, build a sub-irrigated pollinator garden like this in a sunny community garden or even a parklet. More important than some time and money is acquiring knowledge that is being willfully withheld from you. Read on. It's free. Help others by posting this information on your favorite social sites. All of the flowering plants that you see here growing profusely are helping pollinators do their critically important work. The secret is that they are growing in sub-irrigated planters made from widely available drain-hole planters and tote or storage boxes. They are all modified with the installation of water and oxygen reservoirs connected to fill tubes instead of wasteful drain holes. There is no annoying water dripping on your neighbors below when using sub-irrigated planters. And, they are easy to make. There is no need to buy so-called "self-watering" planters. No, these are not "self-watering" planters the utterly stupid term used in the U.S. gardening marketplace. Some use the term because they do not know any better while some use it to deceive the public. Their deceitful purpose is to spread disinformation to inhibit their use. Most commercial growers and garden centers rely on consumption rather than socially beneficial sustainability. They like it when you kill plants. Since most of them grow their plants in greenhouses using sub-irrigation, they are well aware of the sustainability benefits of this method. A popular shorthand term for a sub-irrigated planter is the acronym SIP. When used in a pollinator garden like this the SIP acronym has double meaning. SIPs help grow flowers while conserving valuable water, plants and your time. Furthermore you are helping pollinators like bees, butterflies and other flowering insects "sip" flower nectar while their bodies inadvertently spread pollen. Did you know that along with other crises like climate change we have a decline in our bee population of crisis proportions. I have long slept on a roll-up futon. Its location at night in my new apartment home is right by the sliding doors. I can easily see the bees doing their valuable work. It has been of great meditative value to live with nature so close by. What you see in the photos above is what I see when I wake up. I will soon add some solar up-lights so that I can see the pollinator garden after sunset. I also know when I wake up each morning that I am doing some good for the planet with the expenditure of very little energy and time once the garden was built. That did take some time and energy but it was well worth it. There has been far more value received than I ever expected when I decided to build it at a hectic time of relocating back to the East Coast from California. It took me 3 1/2 months to decide where I would live after arriving by U-Haul, my car in tow on a trailer. As those of us who have done it know it is a lot of backbreaking work to move long distances and reestablish oneself. Though still living in chaos the pollinator balcony garden has become my refuge, my sanctuary. Nothing else matters when I watch the bees doing their critically important work. There are lots of photos of them yet to be published. Stay tuned. There will be much more about this project and my new consulting business. The business is long overdue. I have spent much time consulting over the past nine years in New York and San Diego but it has all been pro-bono without the formalization of a business name. That cannot continue if I am to survive financially. In addition to consulting there will at least one book, probably more than one. Just as for my busy bee friends, there is much work to do. This is about how to make a SIP Pollinator Garden. This is a Fiskars brand 26" Veranda (cement color) planter box. Outside dimensions are: 26.26 x 11.69 x 9.84 (inches). Inside dimensions at bottom of planter: 22.25 l x 7:75 w X 9.0 h.(inches). Other colors available are; Thyme Green, Clay, Pepperstone and Chocolate. This is no rinky-dink box of the type that are widely available in garden centers and home improvement stores. Most of the window box type planters at retail are undersized for lush flower planting let alone have room for a water and oxygen reservoir system under the plants. Unfortunately the Fiskars Veranda planters are not available in stores any more as far as I know. The company is based in Finland and has withdrawn from the highly competitive plastic planter business. The Veranda planters are available online (Amazon for example). They are from inventory not new production. I am going to inquire about the disposition of the molds for the Veranda planters. These planter boxes should make a comeback somehow. Round Ariana planters by Fiskars are also good for making SIPs. They are still available in most Home Depot and Lowe’s stores. I would call ahead for availability. I have used the Ariana planters in terra cotta and green colors for many years. They are reasonably priced and have a nice profile. I will post more about them in a future post in this series about SIP pollinator gardens. There are several Ariana planters in this sub-irrigated patio garden including the tall Dracaena marginata in the middle. Fabrication of “bubble reservoir” SIP pollinator gardens is very simple. The key is to use recycled or inexpensive store-bought plastic containers as the water and oxygen reservoirs. I use the term "bubble" as a metaphor. Think air bubble or scuba tank. The space between the bubble reservoirs forms the wick system. I do all the fabrication with a wood burning pen and a portable drill. There is no need to build DIY SIPs like these with platforms and wicking “cups”. They are basically reverse engineered EarthBoxes and unnecessarily complicated to make. The “bubble” reservoir method works just as well and is much easier to make. Note: Ignore the undersized overflow drain in the photo. That was a mistake that I fixed. The overflow drain is 3/4" o.d. tubing in the finished planter. Three ways to make the aeration/drainage holes are a wood burning pen, portable drill or a very sharp awl (for thin plastic only). I use a wood burning pen. 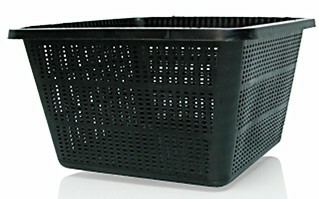 Net pots used in hydroponics would also work and thus avoid the tedious job of making the holes. The "bubble reservoirs" in this box are rectangular and square as you can see. The larger one in the foreground is a shoe box. The smaller one is a storage box that I had in my collection of containers to make SIPs. The planter mix surrounding the reservoirs act as a wick system. It is important to firmly tamp it down to initiate good wicking action. The water rises by capillary action and the root system grows down to find it. Roots are smart that way. This view also shows the fill tube made from a recycled water bottle. I make the hole using the shaft of the hot wood burning pen. I carefully rotate it to enlarge the hole while testing it for the right size using the bottle neck. The photo below shows the very important overflow drain hole on the end opposite the fill tube. It is made from 3/4" o.d. (5/8" i.d.) vinyl tubing readily available from home improvement stores. I drill the hole with a 3/4" spade bit. It needs to be located at the very top edge of the reservoir. After my Calexit escape from unaffordable housing in San Diego, I have decided to start a national "SIP pollinator garden" project. If you are not familiar with the acronym, SIPs are sub-irrigated planters that are perfect for creating pollinator habitats in urban environments. A key to the magic of all SIPs is that they have a water and oxygen reservoir directly below the pollinator plants. You might think of it as a bubble or scuba tank. Using SIPs the only other things needed for the plants to prosper are a place in the sun and a minimum of human care. No green thumb necessary! Even a young child can learn how to grow flowers in SIPs. They are totally kid friendly. Kindergarten (or earlier) would be a good time to start teaching children about them. If so they will become adults who know how to use simple technology to grow both flowers and food wherever they are. Following are photos of the first beta-test SIP pollinator gardens. They are working spectacularly so far. The flowers are healthy and the first watering lasted an entire week in very hot weather. I sheltered them during showers to rule out water added by rainfall. There will be a side by side test of SIPs like these using the same boxes with drain holes some time in the future. Who knows how many times you would need to water traditional flower boxes like these over the course of a week. Probably daily or every other day depending on local climate. SIPs clearly demonstrate that it is long past time to end our national addiction to traditional drain hole "pots" that waste water, plants, time and consumer's patience. They were fine in horse and buggy days of long ago but not in these days of climate change and severe droughts. One of the primary goals of this project is to introduce STEM-based SIP pollinator gardens to all schools in the country regardless of grade level or neighborhood demographics. I am confidant that there is funding available to accomplish this. Stay tuned for much more about this project in the coming days. I have started a SIP Pollinator Garden album on Flickr and will post many more photos to it as this blog series progresses. The album will be similar to the very popular album about the sub-irrigated patio garden in San Diego.